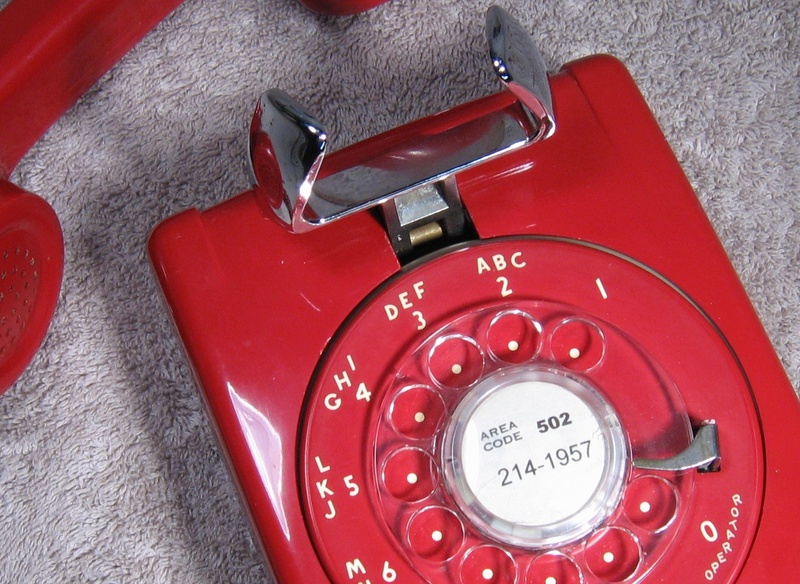 From my collection of “soft plastic” Western Electric Model 554’s is this red one made on Valentine’s Day in 1957. As you can see by the attached photo the case is stamped 2 14 57 3, indicating it was made on February 14, 1957 on the third shift that day—a Thursday. Other dated parts are within a few days of the 14th. I kept the dial card that came on the phone. The 502 area code is from central Kentucky but I think someone along the way stamped the phone number on the original card. What would be the chances that someone’s phone number would be 214-1957?? The Area Code card more than likely would not have been in existence in 1957. Certainly the card was added by a previous owner. The phone came to me with a small crack in the plastic as a result of poor packaging by the seller. With the assistance of my friend, fellow phone collector Mark Scola, the damage was repaired and is now virtually invisible. I am very pleased to have this Vintage Rotary Phone in my collection. Note the wide chrome switch hook, the handset caps missing the center holes and the more recessed soft-center finger wheel. Also, the handset cord is the original thick coiled cord. 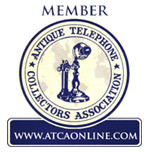 All signs of a true early Western Electric telephone. Happy Valentine’s Day everyone! There aren’t many phones that can beat a red phone for it’s “wow” factor, and this one’s a perfect example of that. What a beaut! It looks like it’s just come out of the box, and is ready for the installer to hang it. Thanks Bingster for the comment and compliment on this red “Valentine’s Day” Model 554. It is amazing to me that something fifty-two years old is in such nice condition and works like it did when it was made. Hi Dennis, I found your site by accident. Gott’a love that Red Wall. You have a real good start on some great looking phones. “Valentine’s Day” Model 554 – What are the odds.. I’ve worked on more phones than most will ever see in a life time and never ran into anything like that. Great Find!! Hope to retire soon so I can work on our collection. Who knows, might even find some time to do some fishing. John, good to hear from you! Thanks so much for the compliment. I also thought that it was unusual to find a phone with this date. The seller actually was selling it near Valentine’s Day and thought the date would enhance the sale. I guess it did because that’s one of the reasons I bought it! I hope that you get to retirement soon. There will be some nervous fish up there in Minnesota when they hear you’re coming after them! Thanks for taking the time to drop a line. It sure is a beauty. I have a restored 304( I think ) on my desk, and a pink Princess rotary in the drawer waiting for some use. Old things are great. My old phones are in a room above a hangar in which resides our restored 1952 Cessna, which is also a joy to behold. Keep up your good work. ex Long Lines, NJ Bell, Lucent. Lou, thank you for your comment and compliments. Now that 1952 Cessna is something I would love to see. I am a Private pilot that has been out of the sky for the past several years. I would love to get back in the left seat and would LOVE to own a Vintage Aircraft. I’ve flown a fast retract and a tail wheel Citabria. I think I enjoy flying “low and slow” with my left elbow out the window and my right hand on the stick the best. But that’s material for my next web site…Hmmm, I’ll have to think of a name. what a great telephone! they just dont make them like they used to,now they are all made in foreign countries and are literally made to last only two years. also, i was born valentines day in 1962! Neville, you are correct—they just don’t make them like they used to! That’s great that you are a February 14th child. 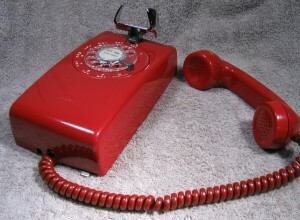 I have since located another wall phone dated the same day as this red one. This second one is a black wall phone, again dated 2-14-57. I always keep my eyes out for the dates. If I run into anything dated 2-14-62 I’ll let you know! 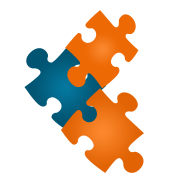 Thank you for your comment and for reading the blog.